Preston boxing ace Scott Fitzgerald won his fourth professional fight on Saturday evening. The 24-year-old outpointed Mancunian Darryl Sharp during the four-round light middleweight contest. Fitzgerald was appearing on the “Leeds Rumble” which saw hometown boy Josh Warrington edge closer to a world featherweight title bout with victory over Patrick Hyland. 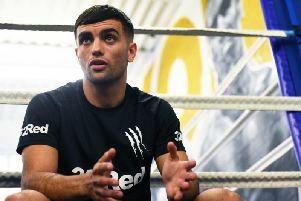 Meanwhile, Chorley’s super-lightweight Jack Catterall will meet Tyrone Nurse in a British title showdown. Nurse defended his title in Leeds when he got the better of Tommy Coyle over 12 hard-fought rounds. WBO intercontinental champion Catterall is next in line to challenge for the prestigious Lonsdale belt.